DermAware’s Go Spot Go™ Moisturizer and Gel duo is ideal for all skin types and skin colors. Lift away existing spots, while suppressing new spots due to ultraviolet damage, inflammation, hormones, acne, and age. An advanced blend of mulberry, arbutin, carboxylic azelaic- kojic acid, and glutathione provide multilevel tyrosinase inhibition: enzyme, decoy, and dopamine. It is enhanced with color corrective oats, vitamin c, pumpkin seed enzymes, and rosehips to further enhance lightening and collagen co-factors. 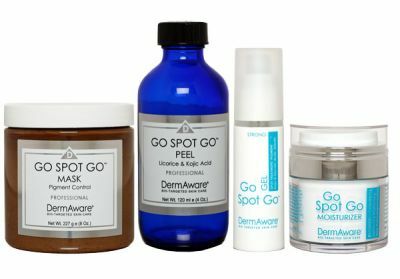 Go Spot Go is also anti-bacterial to control blemishes, anti-inflammatory to reduce inflammation, and inhibitory to control all forms of hyperpigmentation including melasma.